The history of our use of fire in the home from the first fireplaces, the improvements made by count rumford, stoves and now highly efficient modern stoves. The benefits of different fuel types and different types of fire and stove - which one should you choose. Chimney theory - covering the aspects of a chimney which make it draw well including the height and warmth (insulation) of the chimney. Regulations and recommendations for stoves and chimneys. Building a new chimney and where to site it. Different types of new chimney including isokern pumice chimneys. Repointing, rebuilding and repairing chimney stacks. Flashings and terminations. Lining an exisiting chimney with pumice liners, with a flexible chimney liner. Installing a fireplace, inset stove and stove including diagrams of good and bad installation examples. See our installing a stove page. Testing a chimney and common maintainence tasks. Chimney problems, their diagnosis, and their solutions - see our smoking chimney problems page. Fireplaces, Chimneys and Stoves is especially well suited to the new builder or renovator. This is a book for someone who wants to take their chimney seriously - reading up a little first will give you the best chimney possible. Often we get people contacting us who have installed an uninsulated chimney (usually terracotta liners), destined for use with a wood burning stove, when with a little planning they could have installed an insulated chimney from the start. Well written and laid out Fireplaces, Chimneys and Stoves is very easy to understand but does not condescend to the reader. 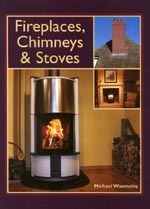 Fireplaces, Chimneys and Stoves is published by the Crowood Press Ltd and is available directly from their website priced at £13.59. They have the books in stock for immediate dispatch. click here to go to the Crowood Press website - then click DIY & Home in the left hand menu.